As another year draws to a close lets take a look at some 2011 round ups – Fashionista’s Most Stylish Ladies in 2011; their fave celebrity nail art from this year; the Fug Girls nominees for ‘Could Be Dressed Better in 2012‘; and finally Buzznet’s ‘Moratorium: Fashion Trends that must Die before 2012’! What were your favourite fashion moments of 2011? Fashion Friday was mine – of course. You guys, here are some more new books! 12 Things To Do Before You Crash and Burn, by James Proimos (121 pages) – Hercules Martino is 16, and the son of a recently deceased famous self-help guru who was no good as a dad. Staying with his uncle for Summer, Hercules is set twelve tasks that will ‘change the way he sees his past, present, and future.’ A book that is short, funny (as promised by Library Journals LLC) and in all likelihood a satisfying read. Light Beneath Ferns, by Anne Spollen (206 pages) – Here’s another not-so-long book; this time a ghost story, not a comedy. Elizah moves in with her mother, who is a caretaker at a cemetery. She finds a human jawbone by a river (!!!) and, at the cemetery, she meets Nathaniel, who is mysterious and, you know, maybe not all there. LITERALLY. Fans of supernatural romance probably won’t be disappointed. Vintage Veronica, by Erica S. Perl (279 pages) – Fifteen-year-old Veronica gets a summer job in the Clothing Bonanza, a second-hand clothing store. She is pretty happy about that! She loves fashion, and her job is to sort out the quality stuff from the rubbish, and she doesn’t have to deal with customers (she has low self-esteem). Two ‘outrageous yet charismatic’ salesgirls befriend her and encourage her to stalk the stock boy as a joke. Soon Veronica realises she will need to come out of her (proverbial! obviously) shell when romance blossoms. The Espressologist, by Kristina Springer (184 pages) – Jane is seventeen and a barista (someone who makes coffee). She has a theory that you can tell a lot about someone by the coffee they drink*, and she uses this to set people up on dates. She’s pretty good at it, so her boss develops it as an instore promotion. BUT she matches her best friend with Cam, which in hindsight was silly since she maybe is a little bit in love with him? Hunters : Phantom – The Vampire Diaries, not really by L. J. Smith (413 pages) – This is a brand-new VD story. Apparently it was written by a ghostwriter, since the publisher who holds the copyright fired L. J. Smith. That seems a bit strange actually! Anyway, Damon is dead, Elena and Stefan can be together, but Elena dreams of Damon. And she loves him a little too. A lot maybe! Soon everyone is threatened by a new darkness. There are a number of times when Rory is confused by British-isms somewhat endearingly, and while suspenseful the novel is also humorous. The first in a trilogy with the next one expected in late 2012! “The golden day is a novel set in Sydney in 1967, ending in 1975, about a group of schoolgirls whose teacher bizarrely goes missing on a school excursion, apparently murdered.”–Author’s note. The language in this was lovely, simple and well thought out. A little like Picnic at Hanging Rock. Well look, some trailers. I haven’t been able to find too many new ones lately, regardless of how many hours I spend watching Youtube. Jack The Giant Killer is based on Jack and the Giant Beanstalk, which, if you don’t remember, is about Jack, giants, and beanstalks. Also Nicholas Hoult is in it, so the film automatically gets 5 stars. Thanks. G. I. Joe : Retaliation is the second G. I. Joe film. Do you remember the first film? All I can recall is how bad it was. So I guess a second film is, in its way, retaliation, for giving viewers it (and Dragonball : Evolution) the benefit of the doubt and hoping for at least a few hours of mindlessly enjoyable action. Anyway, here’s the trailer. Men in Black 3. Part two was released nine years ago, which is a long time in movie franchise years. Here’s a trailer for an ebook download! It’s the Yellow Submarine (by popular British band, The Beatles) and it is interactive. Our first interactive ebook trailer – truly a milestone! MERRY XMAS! LATE ADDITION: Wrath of the Titans (i.e. the sequel to Clash of the Titans) has a trailer. Watch it here! Also Dark Knight Rises has a trailer you can watch here, if you are into Batman (and you are). Here are some new books! We provide so many ideas for things to read it is just ridiculous. Ridonkulous. Belle’s Song, by K. M. Grant (298 pages) – Belle’s father can not walk thanks to an accident that she was responsible for. It is the 14th century so it is kind of important that he be mobile! So she heads to Canterbury with Chaucer (YES THAT CHAUCER) and handsome squire, Walter, in the hope that the pilgrimage has a miraculous outcome. However Belle is being blackmailed and Chaucer is up to his neck in politics and politics back then could be torturous, if you know what I mean. Hard times! Wherever You Go, by Heather Davis (309 pages) – Holly’s boyfriend Rob died in an accident, and she has to spend most of her time caring for her sister and her grandfather, who has Alzheimer’s. Her late boyfriend’s best friend, Jason, steps in to help, and her grandfather says he is communicating with Rob’s ghost (who is in fact narrating the story from beyond the grave), meaning Holly has some tough and unexpected decisions to make. Legend, by Marie Lu (295 pages) – The USA is now at war with itself; the Republic on one side, and the Colonies on the other. In this dystopian future some kids – one rich, the other not at all! – join together to fight against the injustice that authority has become. Nonstop action, a little romance, the ‘characters are likeable, the plot moves at a good pace, and the adventure is solid’, writes the Library Journal. The first in a series, and written about by us previously here (+ book trailer). Dearly Departed, by Lia Habel (451 pages) – Nora Dearly encounters a ‘crack unit’ of teen zombies. They are the good guys! The bad guys are monsters hoping to boost their evil, foetid ranks. Nora begins to fall for one of the good zombies, Bram, who is ‘surprisingly attractive.’ Not sure if the good guys are decomposing or if they’re somehow frozen in a freshly dead state? Is that still gross? The cover depicts them as a little pale but I can’t see any bones or exposed muscle. Still you have to consider these things. Though not too closely! Wildefire, by Karsten Knight (392 pages) – Ashline Wilde is having it harsh at her school – her boyfriend cheated on her and her runaway sister, Eve, has returned to cause trouble. So Ashline starts at a new, private school in California, hoping for a fresh beginning. Buuuuut, Ashline discovers that a group of gods and goddesses have all been summoned to this one particular place. And she is one of them! Soon a war between the gods threatens sunny Blackwood Academy. Don’t know about you but that sounds like just another day for me. That’s about it for now! Check back later in the week for some more. The second book in the Lumatere Chronicles (the first being Finnikin of the Rock). In Finnikin, Froi was a street urchin with no moral compass. In Froi he has become a model student and an efficient assassin in waiting, devoted to his code of conduct and to the Queen of Lumatere. When Froi is sent to Charyn to assassinate the king it seems like an opportunity to prove his worth, but he finds himself embroiled in a chaotic uprising reminiscent of the French Revolution (hangings instead of the guillotine), and in a mysterious curse whose repercussions reverberate around Charyn, and appear to be knocking on the door of Lumatere. This book is wonderful and epic (600 pages, but you’ll hardly notice). At its heart are really real characters, great dialogue, keen observations of the way people are, and an awesome rag tag group of wanderers that reminded me rather a lot of Han Solo, Princess Leia, Chewbacca etc. from Star Wars. Plus: there’s a very twisty twist at the end (third book due next year). Blood Red Road, Moira Young. A fantastic futuristic journey through a wasteland world, with land yachts, cage fighting, an epic quest, and a cool bird. Made me think of the Mad Max movies. Good thing that it’s going to be a movie then, by Ridley Scott (Alien, Blade Runner, Gladiator…). The Floating Islands, Rachel Neumeier. A really successful, original fantasy world (with a mystical, Eastern element): had to try not to think of the movie Avatar with the floating islands idea, because it’s quite different. The potential romanceyness was well restrained, which is nice for a bit of a change. Stuck For Something to Read This Summer? 16.12.11 | Permalink | Comments Off on Stuck For Something to Read This Summer? 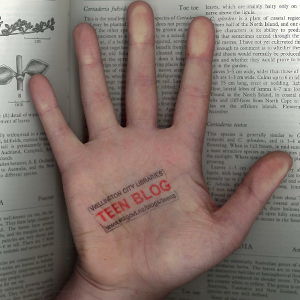 – The Teen Blog summer reading list. This has got selected fiction from this year, loosely divided into categories (like Free Classic Novel e-books, Ghosts, The 20th Century for example). – The New Books tag. Sift through new items that have arrived in the library this year. There’s heaps to choose from. – Kirkus Reviews‘ best of 2011 list. This is an extensive list of excellent reading, from Anna Dressed in Blood to White Crow.